The feline has emerged through the stages of evolution as an obligate carnivore, which means that all cats, from the domestic house cat to the Bengal tiger, are creatures whose carnivorous nature is 100 percent dependent on their species-specific diet: fresh raw prey. 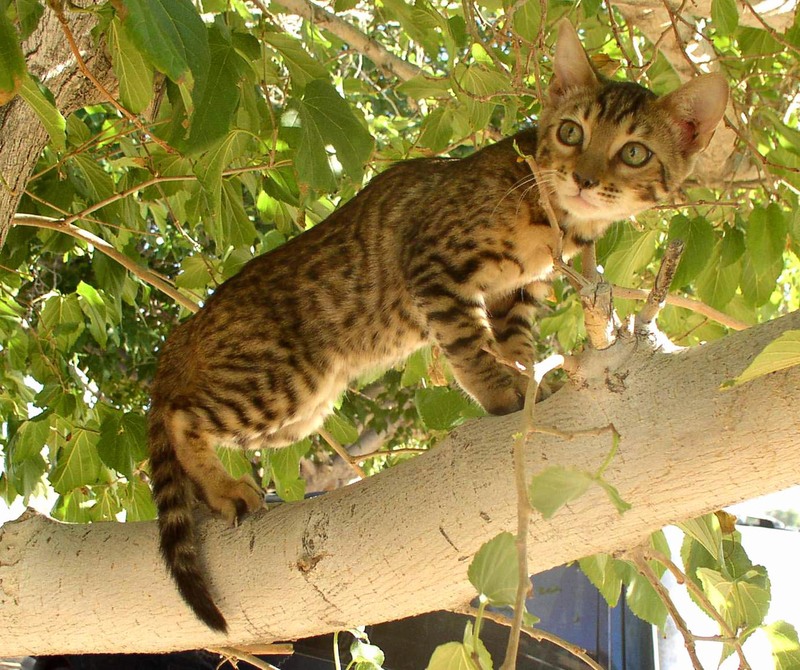 Everything about the cat, from its unique physiology to its behavior, demonstrates that what it needs to achieve optimum health depends on fulfilling its strict dietary requirements. A cat’s mouth contains four long teeth called canines at the front of the jaws. He has sharp serrated teeth at the back of the jaw, which are used to grasp and tear the meat from the bones. These teeth contain an array of pressure-sensitive nerves. When a cat grips a mouse with his canines, his teeth find the space between the mouse’s vertebrae and deliver a quick, clean, killing bite. Remember, in the wild, the cat only gets to eat and feed its young when they win the battle and manage not to have dinner whisked away by another predator. Survival of the fittest is the law of the jungle even if the jungle is your own home. The cat, both large and small gets its nutritional needs met secondhand through the prey animal! It serves as a kind of processing plant for everything the feline needs nutritionally. The cat has myriad receptors for certain chemicals found in their meal of raw meat. Cats can taste if their meat is fresh killed, or if it comes from the meat department of your local health food store. Cats know (in their brain stem and cerebellum, which govern instinctual survival behaviors and thinking) whether the prey is a minute or a day from its end. They may even be able to detect how the prey died if they didn’t kill it themselves. Cats, if given the choice, would prefer their mice (as it is the natural diet of our cats) to our modern store bought meat, but I am not suggesting that you turn your house cats out into the wild and allow them to fend for themselves as for sure it’s a jungle out there today. A mouse in your house may seem like a golden opportunity to test your cat’s natural instincts. But please note that many house mice have ingested rat poison, and field mice can carry infectious diseases and parasites. When cats first began to live with humans and rely on us for their food, they took a huge and risky step. This is because the feline is completely dependent on his prey for his nutrients. The feline has discarded many important biochemical mechanisms that would allow adaptation to other foods (such as carbohydrates, which in nature would only be found in their predigested form in the prey animal’s gut). The feline is bound by his obligate carnivore nature, and he thrives only on meat based foods. Why then do we see so many carbohydrates in commercial pet food? Unfortunately, real meat is very expensive for commercial pet food makers to use, and they must limit their costs to make a profit. Since we don’t care about their profit margin, we can learn to make our own food for cats instead! You may still be asking why it’s so important to feed a diet that mimics what they would eat in the wild. Isn’t dry food the best for cats? Let’s keep in mind that dry food, which many people have become addicted to feeding, as well as the cats themselves, because it may have seemed convenient, but there’s been a terrible trade-off: your cat’s health and well-being. If good nutrition is compromised, your cat is likely to develop one of the following dry-food-related syndromes such as: obesity, diabetes, chronic vomiting, constipation, chronic diarrhea, hepatic lipidosis (liver failure), pancreatitis, arthritis, heart disease, asthma, allergies, inflammatory bowel disease, chronic renal failure, lower urinary tract disease, hyperthyroidism, high blood pressure, Viral conjunctivitis, skin and coat problems, and of course cancer. And what about feline obesity? Thanks to the free feeding of dry food, nearly 50 percent of cats in the United States and Europe are overweight. Obesity is a contributing factor to nearly all of the diet-related diseases listed above. Fat cells produce inflammation, and chronic inflammation ultimately produces disease. Cats require a steady supply, just like us humans of Omega 3′s from marine lipids to keep inflammation at bay. Free-choice feeding of dry food (pouring it into a bowl and leaving it out all day) is without a doubt the single biggest factor affecting our cats’ weight. Getting cats off dry food and onto their species appropriate diet of raw meat, raw bones and state of the art supplements including cold extracted, organic Omega 3′s is the key to weight control. How does a farmer fatten his cattle? The answer is by feeding lots of low fat grain! In most mammals, carbohydrate digestion begins in the mouth with the enzyme amylase that is secreted in saliva; you have to chew for a while to distribute the enzyme. Not only do cats lack salivary amylase, they don’t chew! Cats, after they shred, tear, and bone crush, swallow their food in large chunks. Cats have no dietary need for carbohydrates (except as young kittens, which is why there is lactose in the mother cats milk). Most other mammals (humans included) use carbohydrates as their bodies “highest octane” fuel. For these animals, the energy system is based on an enzyme called glucokinase, which we think of as the feast or famine mechanism. This system is used by athletes who “carbo-load” (eat a big pasta dinner the night before an event). The glucokinase system is kicked into high gear, sending a massive dose of energy to the body, which in the athlete’s case is stored in the liver and muscles as glycogen. The day of the race, the body has extra glycogen to use as fuel–a big advantage for the athlete. Cats do not operate on the glucokinase enzyme system; they use protein and fat directly for energy. The small amount of carbohydrate they get in their natural diet is handled by hexokinase, an enzyme system that cannot speed up to handle large meals or slow down during a fasting interval. When fed carbs such as those found in nearly all dry foods and many canned as well, cats store them primarily as fat, not glycogen. The purpose of carbohydrates in commercial cat foods is a source of “energy,” which simply means calories and is also just a cheap filler to save money on meat. For cats, these carbs are empty calories. This is why cats that eat dry food so often get fat! Just like Farmer John fattens his cattle on the low fat grains! The cat uses dietary fat and protein for energy; if these are not supplied, it must break down fat and protein stored within its own body. Be he wild or tame, large or small, the cat’s basic structure and function have not changed through the ages. Breast feeding is critically important for all species as it contains certain essential fatty acids that are needed to develop our brains properly. 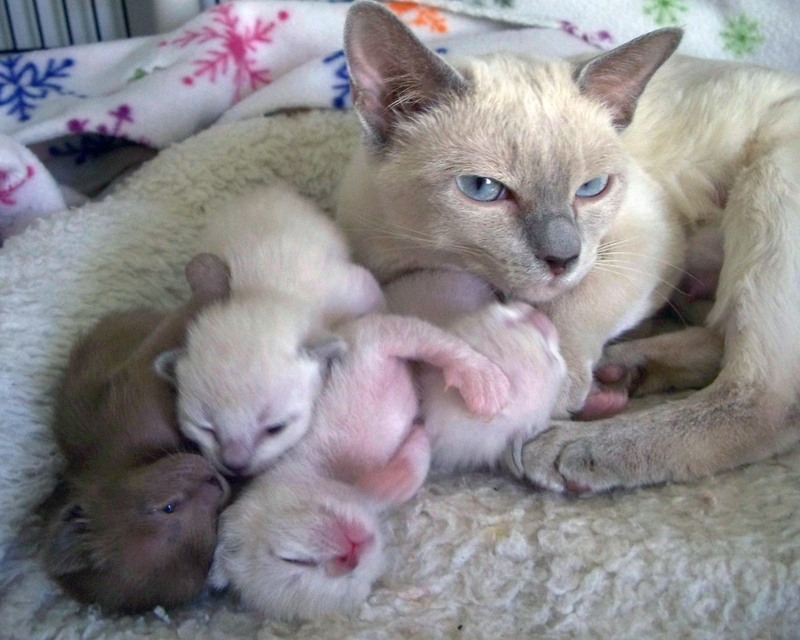 Here is Celestecats Lalique (a Tonkinese Cat) with her 4 babies. She had this one litter and retired to be our precious pet as this was close to the end of my 11 generations where I raised the cats and kittens all on this diet, the supplements I include the recipe that I designed with a holistic vet and the modalities in my book! Our precious Tonkinese,Celestecats Lalique with her four babies! We are all retired from breeding now and have been for several years. Our focus is now on rescue and education on the benefits of holistic health care for people and pets! When preparing a homemade raw food diet, it’s vital to remember that cats cannot live on just meat alone. There are many case histories of unfortunate cats who suffered and died from being fed only meat (or fish or liver). As an example, there is virtually no calcium in meat. A cat fed a meat-only diet must satisfy its calcium requirement by stealing from its own bones and ultimately can fracture a leg just walking across a room. Using the prey animal as our model, and taking into account the vitamins and minerals found not only in its meat but its blood, bones, glands, and organs, we can formulate a balanced homemade diet for our cats without the help of a pet food company! There are several nutrients found only in meat and organs that the cat must get from the diet and are the key to its status as an obligatory carnivore. Our feline diet, must include the following very specific nutrients that other carnivores, such as dogs, meerkats, raccoons, and bears, do not require. Before going on to discuss the species specific nutrient requirements for cats, I must address “the elephant in the room” because everyone of us humans can decide for ourselves through our own research or philosophy what is the best diet we can eat ourselves but this is not the case for our carnivore companions, who live under our control in our homes. We need to face the fact whether we like it or not that cats are not vegetarians! If you are vegan or vegetarian and you want a vegetarian animal companion that you can feed according to your personal philosophy, you can get a rabbit, rodent, bird, or goldfish–but please do not feed a carnivore a vegetable based diet. If you want to share your life and home with a cat, you need to honor his “obligate carnivore” nature which has been his birthright for 20,000,000 uninterrupted years of evolution. A non-meat-based diet is not appropriate for a cat. A vegetarian diet will leave your cat malnourished with no reserve to fight injury, stress, or disease no matter how earnest the formulator of the vegetable based diet is. I know vets who would not even perform surgery on a cat fed a vegan diet because they may not survive and if they do won’t heal well. So please give your personal philosophy a good think when it comes to the feeding of a cat. The amino acid taurine is essential for the health of cats eyes, skin and especially their hearts. We find taurine abundantly in their mother’s milk and then in rich supply in muscles, eyes, and brain. The prey animal’s heart is a muscle, this is a good source of taurine. Unlike dogs, cats cannot manufacture taurine from other amino acids, and they depend on a steady stream of it in their meaty meals. Taurine is not found in plants. Remember that the prey animal is the processing plant for the cat’s nutritional needs. Pet food companies supplement with taurine and I include extra taurine in my homemade recipe, even though it is found in abundance in the raw meat. I feel it is such a critical nutrient for cats that I prefer to err on the side of safety and just add some extra to their food. Before pet food manufacturers added taurine to their prepared foods, thousands of cats died of heart failure due to taurine deficiency. Isn’t it amazing that they advertised their food to be 100% balanced even then? They found out the hard way that their cooking and processing destroyed taurine’s bioavailability. Because taurine is found in between muscle cells, it is often lost in the meat grinding process. When meat is defrosted and the blood drained off much of the taurine is lost this way as well. Another amino acid essential for cats is arginine. Mammals use arginine in one pathway to metabolize ammonia, a toxic waste product of protein digestion. Only the feline relies on arginine as its sole pathway for this reaction. A single low arginine meal will poison a cat on its own wastes, causing it to drool, stumble, and possibly seizure or die. Its mother’s milk and meat are the cat’s natural source of arginine. Vitamin A is a feline requirement that can’t be met by beta-carotene as it can in dogs. If you feed your cat carrots, he won’t be able to get any vitamin A out of them. There is no pre-formed vitamin A in carrots; only beta-carotene, which cats cannot convert. Cats get their vitamin A needs met through their processing plant, the prey animal. The prey’s liver is a rich source of pre-formed vitamin A. People can turn precursors into biologically active vitamin D via the skin when it is exposed to sunlight. Cats love to spend hours laying in the sun, but they do not get any vitamin D this way because they do not have the right enzymes in their skin. The prey animal’s liver is the cats’ natural source of vitamin D.
Niacin, also known as vitamin B3, plays many roles throughout the body, including production of hydrochloric acid, formation of red blood cells, and generation of energy from foods. Most animals can make niacin in their own bodies from tryptophan, which we find in meat and the mother cat’s milk. Cats have a very high need for niacin; they cannot create enough on their own and must consume it daily. Arachadonic acid is a fatty acid essential for cats, arachadonic acid plays an important role in maintaining healthy skin and coat. It’s critical in reproduction and in healthy kidney function. Most animals can convert linoleic acid, which is found in animal fats and healthy oils, into arachadonic acid. Cats cannot manufacture arachadonic acid, which they primarily get from organ meats, such as heart, liver, and kidney. Cooking meat degrades arachadonic acid. Love, although I have listed it last is certainly not least! As far as I am concerned it is the most important component in our homemade species specific feline diet! When we add love as an ingredient while making our cats’ food, we are actually doing something quite scientific. A series of experiments studied rabbits that were fed a high-cholesterol diet (and there is much debate on the cholesterol issue these days but that is another discussion) intended to cause atherosclerosis. One group of rabbits received standard lab animal care (fresh food and water but minimal handling) while another group received daily visits from an experimenter who petted, handled, played with, and talked to the rabbits, essentially making them pets. The pet rabbits, who ate the same food as the other experimental rabbits–and whose blood cholesterol levels, heart rate, and blood pressure were also the same00had 60 percent less damage to their arteries. Hmmmm, me thinks love is pretty essential but how much love went into the making of that food at the pet food factory or goes into opening a can of food or tearing open a bag of kibble in our homes? Many people become very squeamish when they first hear about feeding raw meat and raw bones. Remember that this would be the cat’s choice in the wild, if they were given one. Now that cats live with us in our homes, we have removed that choice and forced them to eat things they would never find in the natural world, like kibble! There are no kibble bushes out side for them to graze on! Bacteria and parasites found in raw meat mandate safe meat handling procedures (by humans). The cat itself has its own natural defenses. First, saliva contains an enzyme called lysozyme that attacks bacteria and other pathogens as the raw meat enters their mouth. After this, any remaining contaminants must pass through the cat’s extremely acidic stomach where the vast majority of bacteria are killed. The cat’s very short small intestine pushes the raw meat through their system quickly so invaders cannot get a foothold. (The cat’s body length-to-digestive tract ratio is only 1:4, compared to 1:6 for the dog and human, 1:12 for the horse, and 1:20 for the cow.) Another great bit of information for why it is imperative to feed cats raw meat! This short intestinal tract is one of the hallmarks of a carnivore. Finally, the undigested portion of the food passes through the large intestine, where competition from normal resident bacteria protects against invaders. These defenses destroy approximately 98 percent of bacteria such as Salmonella. Freezing raw meat for seventy-two hours at 24°F (-4°C) kills protozoal parasites such as Toxoplasma. While it’s true that bacteria aren’t affected by freezing, consider that a mother cat licks the backsides of her kittens, and she ingests what comes out of them for several weeks following their birth. Cats lick their own bacteria-laden backsides and bodies for the rest of their lives, so you can appreciate the natural cleansing ability of the cat. However, depending on the health of your cat, you should proceed cautiously to introduce a home-made diet. If your cat is extremely immune compromised by cancer or another serious condition, you may need to begin by cooking the meat a little bit at first and proceed to the ultimate goal of 100% raw with your vets approval. Okay, now you have decided for all the right reasons to make your own cat food. 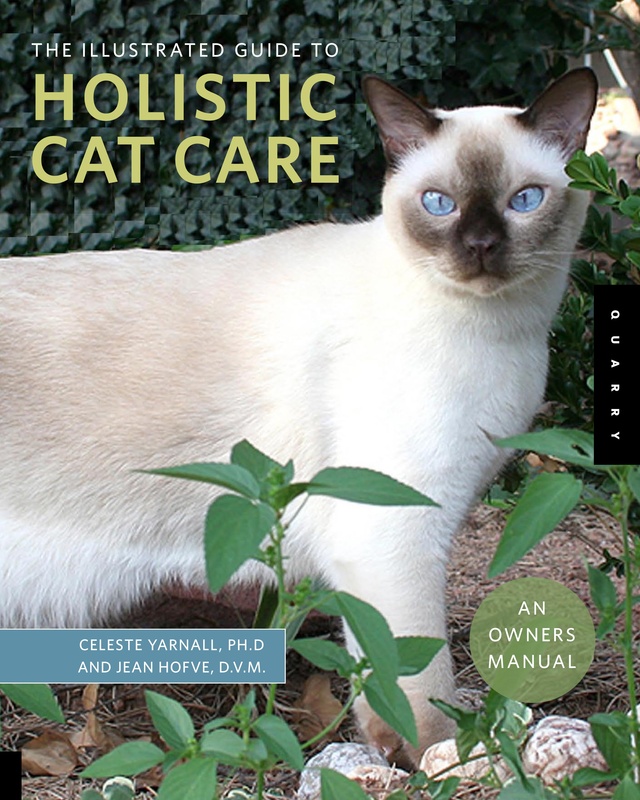 You may have performed independent research or perused some books, hopefully my own Complete Guide to Holistic Cat Care, which I co-authored with Jean Hofve, DVM. Be cautious about some diets you might find on line and the recipes found in pet cookbook’s as many of these are not complete or balanced nor have they been adequately tested over long periods of time on multi-generations of felines. Serious problems can arise from simply feeding raw meat without bones or bonemeal for a source of calcium. The feline diet needs to consist of raw meat, organ/glandular meat and raw bones/bonemeal, but also whole food supplements that provide all necessary nutrients, including vitamins, minerals (besides calcium), trace minerals, co-factors, healthy fats, enzymes, amino acids, pro-biotics and possibly a few other super-nutrients which may be helpful for individual conditions. Please don’t add a human supplement without clearing its ingredients because several super foods such as alpha-lipoic acid and resveratrol are dangerous for cats. Here is the diet that I raised 11 generations of my beloved Tonkinese Cats on for nearly 20 years with incredible health results as the reward for this effort. Watch this video to see Celestecats Matrix have a raw meat snack! YIELD: Approximately two to four days worth of food for an average ten-pound (4.5 k) adult cat. Increase for kittens and pregnant or lactating queens who require more meals per day. 1 lb. (0.45 kg) raw coarse ground, or diced beef or poultry, up to 25 percent fat (Do not use pork or fish) Try lamb, venison, elk, bison, ostrich, quail, and alternate and/or combine meats for variety if you wish. 1⁄4 lb. (100 g) raw diced organic, organ meat, such as liver, kidney, heart, and gizzard, spleen, etc. (turkey, chicken, beef, or lamb). 8 ounces (250 ml) purified water combined with 4 drops of grapefruit seed extract (GSE) liquid concentrate. One drop of liquid garlic extract such as Kyolic Aged Garlic Extract. 1⁄8 to 1⁄4 teaspoon digestive enzyme supplement made for cats or one human digestive enzyme capsule. 500 milligrams taurine (powder or capsule). Many people swear by adding 2 to 4 ounces (60 to 120 g) food-processed raw zucchini (or pureed steamed), food-processed or pulped raw or baked yams, canned organic unsweetened pumpkin, or organic baby food vegetables such as sweet potatoes (yams), carrots, or winter squash. (No corn or white potatoes, please.) However, I only feed the meat mixture as described above with the raw bone ground right into it. I have found a butcher who does this for me and he includes the appropriate organ meats, such as a bit of kidney, liver, heart, gizzards, etc. 1. Because all whole bones (including vertebrae) can possibly splinter, (it is said by many that only cooked bones splinter) you can have your butcher grind chicken backs and necks or even a whole chicken. Be sure the butcher runs them through the grinder at least three times. This is what I have my butcher do for me with the organ meats included. You could also purchase your own meat grinder and grind your own meats and poultry. 2.You may also use a mallet to crush whole chicken necks and cut into thirds and tuck them into their food to give them something to “bone crush” which also serves to clean their teeth naturally. Do this if you are nervous about feeding them cut into good size chunks, but feed the chicken necks with food as it helps them to have food in their stomach already. This is the order in which they eat in the wild, bones are their desert! 3. Treat the raw meat/poultry with the purified water/ grapefruit seed extract liquid concentrate as described in the recipe above. Note: Never use grapefruit seed extract straight (internally or externally). It will cause serious chemical burns. It must always be properly diluted. 5. Cut the organ meats and any other larger pieces of meat into bite-size chunks. A combination of some ground meat helps the supplements mix nicely and then chunks of meat of cut chicken necks give them the chance to bone crush. Liver can be cut partially frozen and cut into cat size bites. Chicken necks can defrost and marinate in this solution as well rendering them a little softer until you are ready to serve them. SWITCHING FOODS can be dicey, if you are just starting your cat on raw meat and raw bones you will find that many cats and kittens immediately love their new homemade diet. It’s a good sign to have a cat with a hearty appetite. But for others it takes a bit of strategy to accomplish this goal. Here are some tips for making this transition. For cats who have had food available day and night (free choice), the first step is to go to a timed meal schedule, where you leave the food out for an hour in the morning and again for an hour in the evening, but put it away the rest of the time. Believe me, your cat will not starve to death in twelve hours. 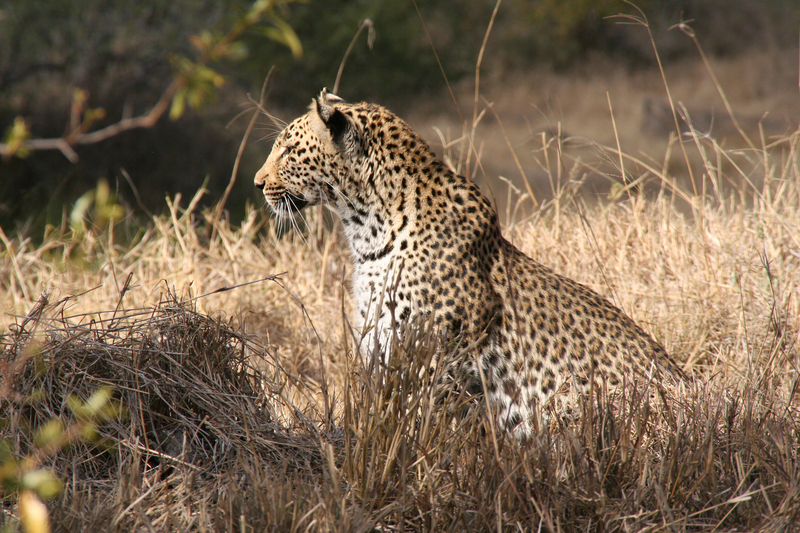 The eat-fast-eat schedule is more natural to carnivores, and it gives them time to digest between meals. Also with this schedule, you don’t have to worry about restricting the amounts you feed; the cat will eventually self-regulate on this schedule. The other big advantage of timed meals is that your cat will be hungry at mealtime, and thus more willing to try new things. This is particularly critical when switching from dry food. Increase portions or feed more small meals if your cat gobbles it all up and wants more; amounts can vary from meal to meal. About two heaping tablespoons per cat twice a day for adults, (3 to 4 times per day for kittens, pregnant queens and nursing mothers). Do not overfeed because cats have a mechanism that will cause them to throw up their entire stomach contents if it is over filled even by a tiny bit and over 2 heaping TBSP’s at one serving, is over filling. Better to feed more often then risk this. But cats don’t always want to eat every meal you serve them. Give them a little flexibility to make their own decisions. Some times, at some meals, you are not so hungry, right? Leave food down to begin with for approximately an hour. If it’s too warm in your home, or if flies are a problem, shorten the time. If ants are a problem set the cats flat plate on another slightly larger plate with a little rim, filled with purified water. Ants don’t like to cross the moat! Many people, myself included have left the food out for hours, even all day without incident but again err on the side of caution and do what you feel comfortable doing. So much of this is merely common sense. I recommend that cats be fed on flat plates (a slight rim is fine as cats hate to have their whiskers touch the side of a bowl) and let them eat at their convenience in peace. If they walk away, so be it. They’ll be back when they are ready! Cats and kittens want their food very fresh. Therefore, keep food in the refrigerator for no more than three to 4 days. Store the food in glass bowls with tight fitting lids. Plastic off-gasses organo-chlorines, which are toxic to people and pets and alters the taste for the cats. (Always defrost meat in the refrigerator, not on the kitchen counter. And never microwave it, (that is a whole other story). Keep in mind you can make up large batches of this recipe and freeze for later meals, too! Freezing is fine in plastic but change to glass to defrost. Safe handling of raw meat is imperative. Wash hands, dishes, and utensils in hot soapy water. Clean surfaces with environmentally safe cleaning products, such as a solution of 1 drop of (GSE) grapefruit seed extract per ounce (30 ml) of water. Try to use a vitamin/mineral supplement designed for a homemade carnivore diet. Because noting existed for this purpose when I began making my own food, I designed one with a holistic veterinarian formulator as I simply couldn’t find anything suitable and easy that met my requirements for my own animals and my clients. I will only use human grade ingredients and I am very picky about everything that goes into their body and mine. This particular supplement that I have used for nearly 20 years includes correct proportions of bone meal, super greens, plus gland and organ powder to balance this raw meat and raw bone recipe properly. Check my website http://www.CelestialPets.com for my books and articles and supplements that augment the recipe which I designed and have used on 11 generations of raw food fed kitties for over 20 years now! Our three cats love their Celestial Food! Please remember that there is nothing better than a properly prepared homemade diet but nothing worse than an improperly prepared one! You may have already worked all this out for yourself, but if not and you need help, we at Celestial Pets are here for you! You can call the office at 818 707 6331, or email us at CelestialPets@CelestialPets.com. My business partner Imelda Lopez-Casper is expert at helping you transition from dry and canned food to homemade raw food! I am also available by appointment for Holistic Life Coaching for both people and pets for an hourly fee. Like what you’ve read here? Please tell 50 of your closest friends and come join me on Facebook -;) http://www.facebook.com/pages/Celestial-Pets-Holistic-Health-Care-for-Pets-and-People-Too/146197148784073. insightful blog! super like it! I just clicked like on your beautiful Rose. I’ll post my husband’s Rose Nebula at the Art of Wellness on FB for you! I have nominated you to have a Beautiful blogger award. Copy the URL of the image’s award and post it to your blog. enjoy your prize! Nizy..where is the URL..I am a bit new here and don’t see it (LOL)! Hi Ms Celeste! Look at those cute cats! Reminds me of my childhood days when I used to tend to our little kittens and give them milk. We had about at least 3 cats that became 6 due to stray cats joining in and somehow they just ended up camping out in our house. What a great idea to make Homemade Foods for them. Lots of cat lovers would love this post. P.S. just tried clicking your Facebook link but it’s not working and saying page can’t be found. Also, did you guys do your banner via Pixlr? Or somewhere else? Love the look. That’s awesome. I’ve just added or liked you guys on Facebook. 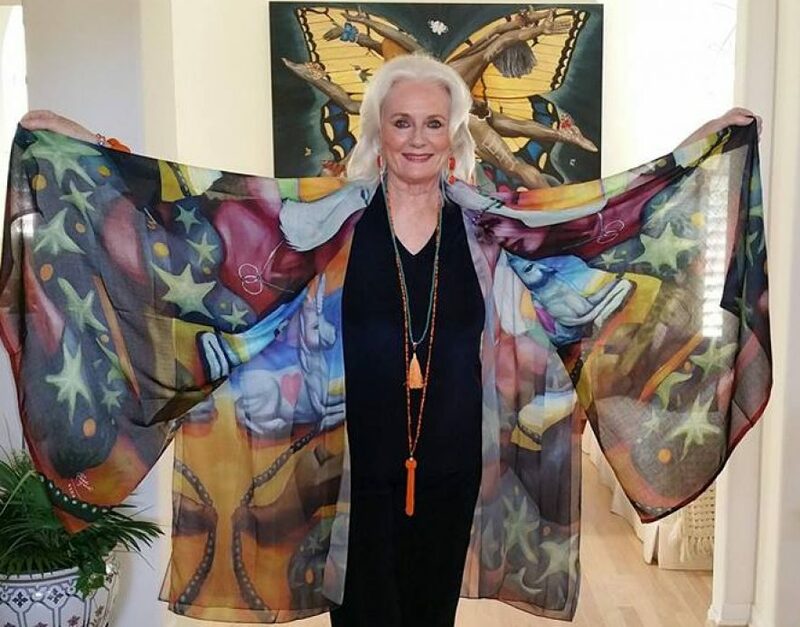 Merry Christmas and Happy New Year from CelestialMusingsBlog and me, Celeste Yarnall!